As an email marketer you understand how important the balance of the email frequency, relevancy, and audience expectations is. Every open and click does matter. Now you can stop guessing what will work and what won’t work in your email marketing campaigns and start split testing your email to improve your campaign response and sales with measurable scientific methodology. Testing is the engine of email marketing and G-Lock EasyMail makes this challenging task a breeze to run for everyone. Realtime email tracking service to monitor email performance metrics. As an e-mail marketer you’re surely wondering what happens with your email after it is sent. Did your subscribers open it? How many people opened your message and clicked on your links? Not only do such metrics help us identify active and inactive subscribers on our lists, they also help us understand whether our email is relevant to the expectations and interests of our recipients. 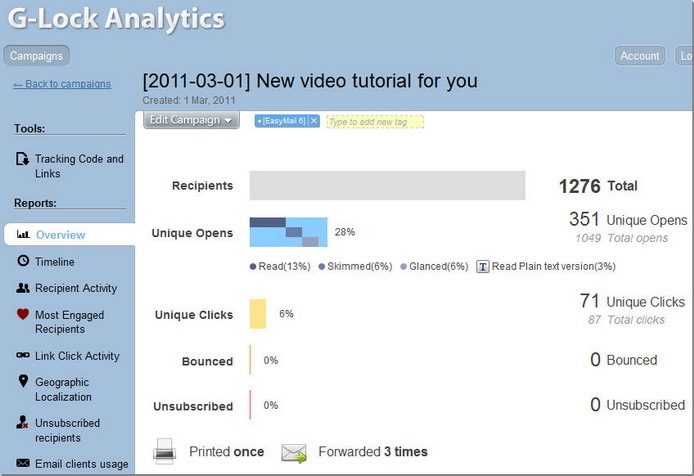 That’s why we collect email tracking metrics – to analyze them and search for ways to improve them. As everything in the Internet, email marketing is constantly changing. A never-ending flow of spam entails the appearance of new strict anti-spam technologies and filters. It makes more and more difficult for legitimate opt-in emails to survive and forces e-mail marketers to debug their e-mail programs. As email marketers we are continuously searching, testing and experimenting in quest of new ways to improve our e-mail performance. And this is reasonable because only using trial and error method we can discover the email tactics that work best for us. In one of the recent articles I wrote how you could improve your email open rate by using creative Subject lines. Now I would like to cover the topic from another perspective and tell about the format of the email message.